ALL OF OUR PRODUCTS ARE NSF CERTIFIED AND WATER QUALITY TESTED. THIS UNIT IS GREAT FOR RENTAL APARTMENT. NO HOLE TO DRILL JUST CONNECTS TO YOU FAUCET AND YOU ARE GOOD TO GO. 4 STAGE REVERSE OSMOSIS SYSTEM WITH 50 GPD. 1ST STAGE SEDIMENT FILTER INLINE FILTER 5 MICRON 2" X 10"... 2ND STAGE CARBON IN-LINE FITLER 5 MICRON 2" X 10" RATED FOR 1500 GALLONS. 3RD STAGE MEMBRANE 50 GALLON PER DAY. 4th STAGE IS ALKALINE FILTER. 5TH STAGE 1N-LINE POST CARBON FILTER 2" X 10". Yearly Replacement Filters: Stage (1,2,5). 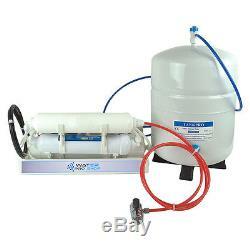 50 Gallon Per Day Reverse Osmosis Membrane - Drinking / Aquarium Water Systems. Alkaline Filter Stage 4 (Replace after 2 years). THE REVERSE OSMOSIS WATER SYSTEM COMES WITH QUICK CONNECT FITTINGS. SYSTEM COMES WITH FDA FOOD GRADE TUBE. COLOR CODED TUBES FOR EASY INSTALLATION. COMES WITH FAUCET ADAPTER FOR EASY CONNECTION OR GARDEN HOSE ADAPTER. (KINDLY REQUEST WHICH ADAPTER YOU WILL LIKE OR WILL SEND ANY ONE OUT WITH SYSTEM). Comes with a 2 gallon tank. 8" x 10" Small compact. TANK VALVE AND BALL VALVE. The following conditions for feedwater supply must be met. Do not allow RO System to freeze. The membrane always contains water and will be destroyed if frozen. Do not plumb RO System to hot water. This will destroy the integrity of system components. If pressure B 40 BelowA pressure regulator is advised to maintain proper pressure. RO System must be connected to a municipal or well water source that is treated and tested on a regular basis to insure bacteriologically safe water. Operating Temperatures : A Maximum 113° F B Minimum 39° F 3. Operating Pressure : A Maximum 115 PSI (5.95 kg/cm2) B Minimum 40 PSI (2.95 kg/cm2). Personal checks may be held until cleared. (REVERSE OSMOSIS) DRINKING WATER SYSTEM. Drinking Water System when installed and operated within recommended parameters, with the exceptions stated below. How Long Does The Coverage Last? Drinking Water System that is damaged because of neglect, misuse, alterations accident, misapplication, physical damage, or damage caused by fire, acts of God, freezing or hot waters or similar causes. The item "PH Alkaline Portable/Counter Top Reverse Osmosis Drinking Water Filter System" is in sale since Tuesday, July 26, 2016.